The Indoor Palm tree, since before the days of ancient Rome, has been a symbol of triumph. Today, in addition to this victorious connotation, its appearance may suggest the sway of coconut palms, or the swish of bamboo in trade winds. The fan palms bring to mind Egyptian sculptures and thus recall exciting civilizations of times past. There are thousands different palms found around the world. It is probable that the majority of these would not be pleasing for house or greenhouse culture. However, there are palms to represent all of the classical growth habits and shapes that may be grown as indoor palm trees in climates too cold for them to be outdoors. Some palms, by nature, are small enough that they seldom outgrow the bounds of usefulness as indoor plants. Others are container-grown while young. The slow growth of these may render these palm trees valuable house and greenhouse decorations for two or more decades. Caryota mitis, Caryota urens – Fish-tail palms – Outstanding for container culture while young. Provide constant moisture, warmth (60-80 degrees), bright light, some sun. Chamaedorea elegans, Chamaedorea elegans ‘belle’ – Miniature palms. Known variously by the names Neanthe belle and Collinia elegans. These are some of the best-known palms of this genera. 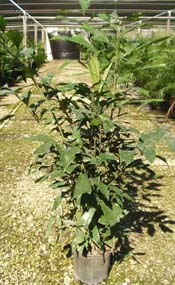 All of the chamaedoreas are excellent for house and greenhouse. They need warmth (60-80 degrees) and shade. They like to be moist, but are more tolerant to drought than most palms. Chamaedorea elegans belle remains diminutive for an indefinite time. Chamaedorea cataractarum – Dwarf, showy for indoors. Grows to single trunk. Plants male or female; females bear attractive scarlet fruits. Chamaedorea seifrizii – Bamboo Palm – Bears clusters of small, slender, cane stems. It has an overall lacy appearance. Chrysalidocarpus lutescens – Areca Palm – Butterfly palm. Has willowy, furrowed, yellowish canes in a clump. Temperature range of 60-80′. Likes moisture, some sun, or bright daylight. Tropical and cannot stand frost. Forms many clumps, sometimes more than a dozen in one small pot, and thus it serves as a showy container-grown plant. Howeia fosteriana – Kentia Palm – The palm used so much by interiorscapers. Temperature range of 50-70 degrees, shade to partial sunlight, moist soil. They tolerate some frost when grown outside. Outdoors they grow up to 50 or more feet tall. Indoors they are slow-growing and showy in containers. Licuala spinosa – The segments of the fan-shaped leaves of this palm are plaited, terminating as if they had been cut squarely with pinking shears. Forms clump. Excellent for indoors but needs space. Reinhardtia gracilis – Window Pane Palm – Unusual and should be grown more in pots. Shade-loving. Likes warmth, humidity and moist soil. Chamaerops humilis – Fan palm, Dwarf. Thrives in temperature range of 50-70 degrees, likes sunlight, some fresh air, and moist to wet soil. Especially useful on a sun porch that gets cool at night. Livistona rotundifolia and Livistona chinensis – Fan palms. Individual leaves sometimes more than five feet wide. Single-stemmed. Container-grown while young. Striking. Good on a sun porch. Phoenix roebelenii – Dwarf date palm – Thrives under wide temperature range. Likes some fresh air; grows in partial sunlight to shade. Keep moist at all times. Older plants in the open will stand 18 degrees. One of the showiest, most graceful palms to grow in house or greenhouse. Chamaedoea elegans, Chamaedorea metalica, or Reinhardtia gracilis for small table top use.